A roadside cemetery lay alongside Watling Street 1km south-east of the Roman settlement of Southwark. The cemetery supplanted 1st-century roadside building and field systems, and was in use from the mid 2nd century until at least the early 3rd century. A total of 25 inhumations and five cremations were recorded. High-status mausolea and other burial structures may be indicative of private plots used by wealthy families. A possible temple was recorded, as was important evidence for funerary rites. A bustum contained the cremated remains of a female with at least nine pottery tazze, eight pottery lamps and an exceptional array of plant remains, many imported from the Mediterranean; images on the lamps include Anubis and a gladiator. Catalogue of burials and associated finds. MoLAS, London 2000. ISBN 1-901922-11-X. Pb74pp. 44 bl/wh ills. 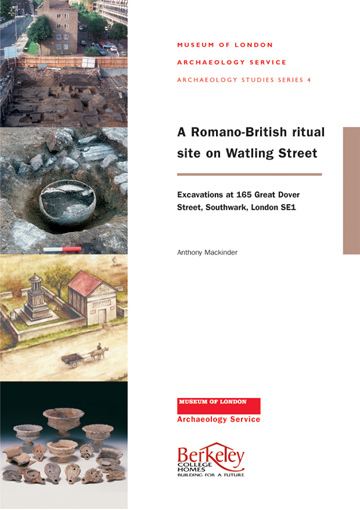 "All in all a significant study of the southern cemetery [of London] that makes an important contribution to our understanding of Londinium and to Roman cemetery studies in general."